For Wolfy’s birthday, we took a trip to Lowe’s and purchased a paint sprayer for him. So many of the blogs I follow recommended Graco TrueCoat Plus II Electric Airless Sprayer. I decided that should be the one we try. So, we purchased this one and an extra sprayer cup. 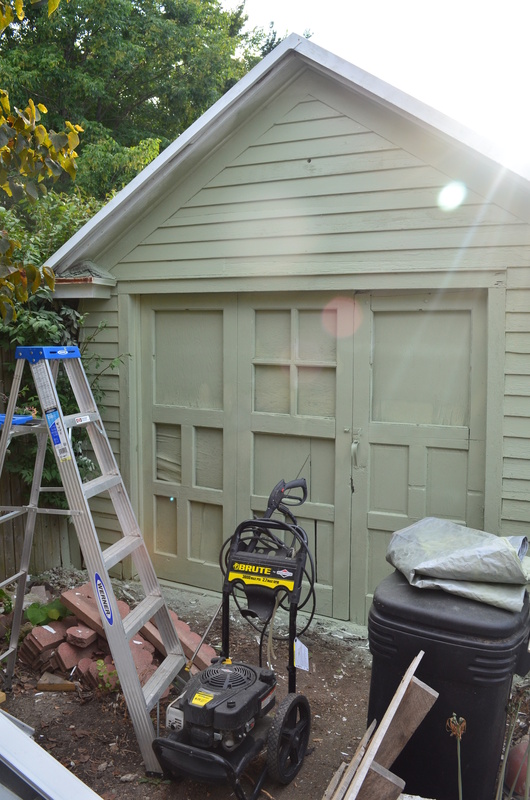 The first project we tackled with our paint sprayer was the garage. 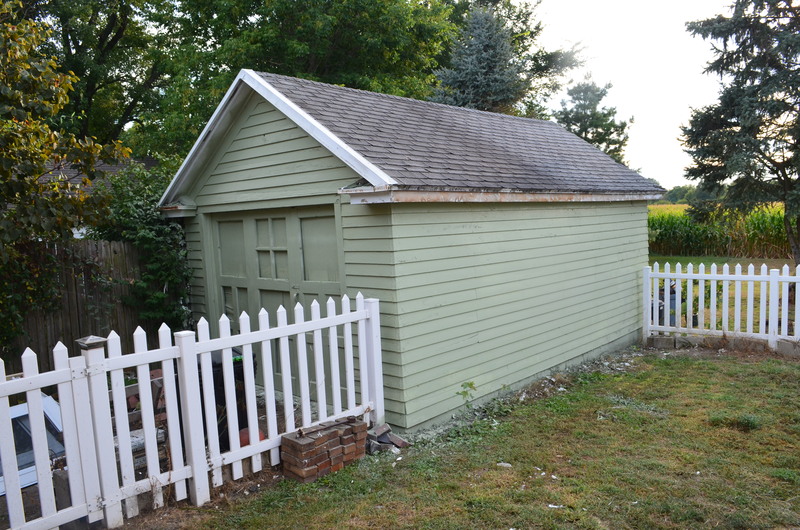 Before this project (as you can see in the picture above after it was power washed) the garage was painted white. The paint was peeling, and some of the wood was in pretty bad condition. 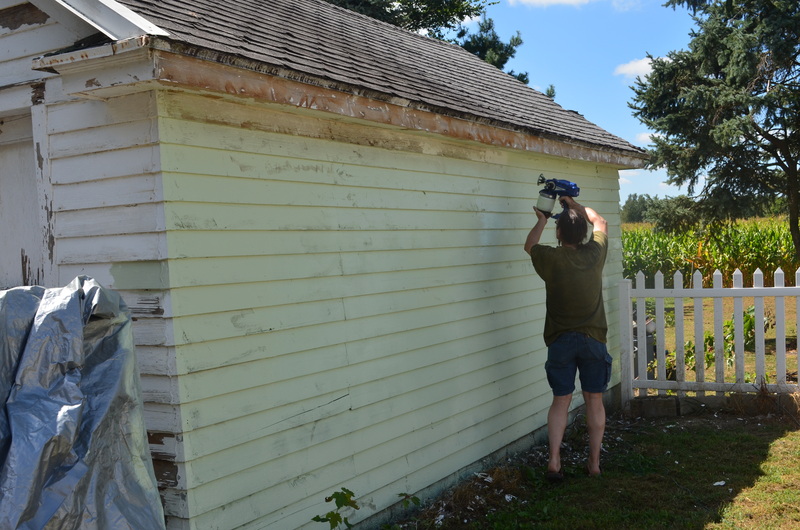 If we would have had to use a brush or roller, I think we would have given up and covered it with new siding. But, after we got into a rhythm the coats only took us 20 minutes apiece. 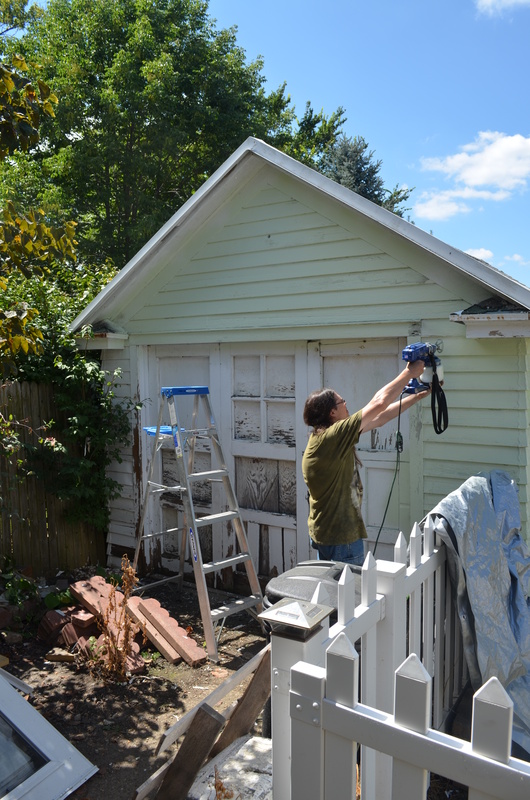 We ended up applying 4 coats (the first was a shade too light, but after a trip to Home Depot we were able to fix that by color matching a swatch of leftover siding). 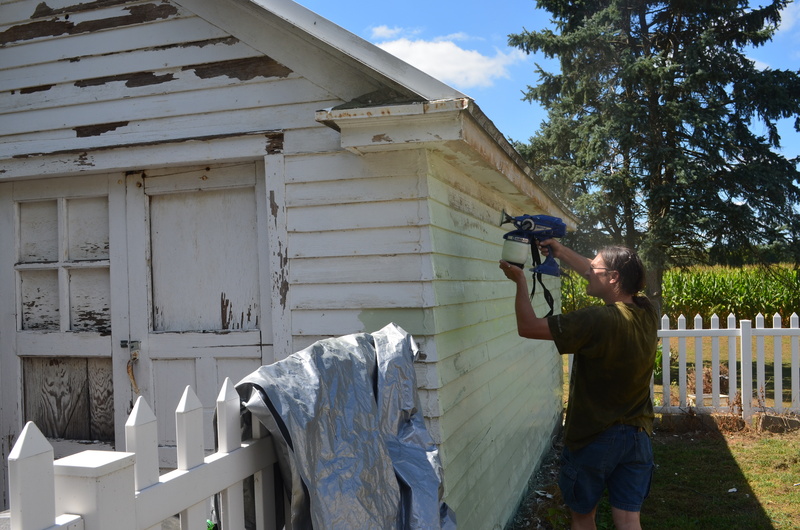 There was a bit of overspray, so we wrapped the fence posts with a tarp when painting near them. 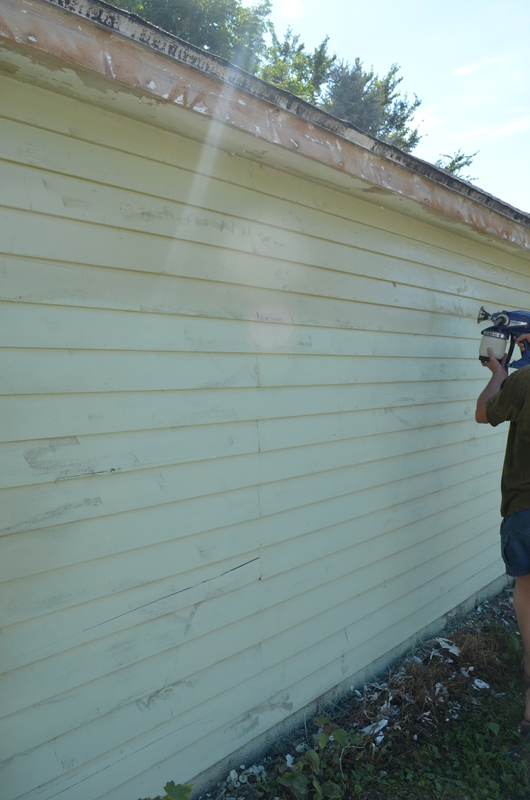 After a day’s work we were left with this – and a new appreciation of our paint sprayer. Something to brighten up the inside. 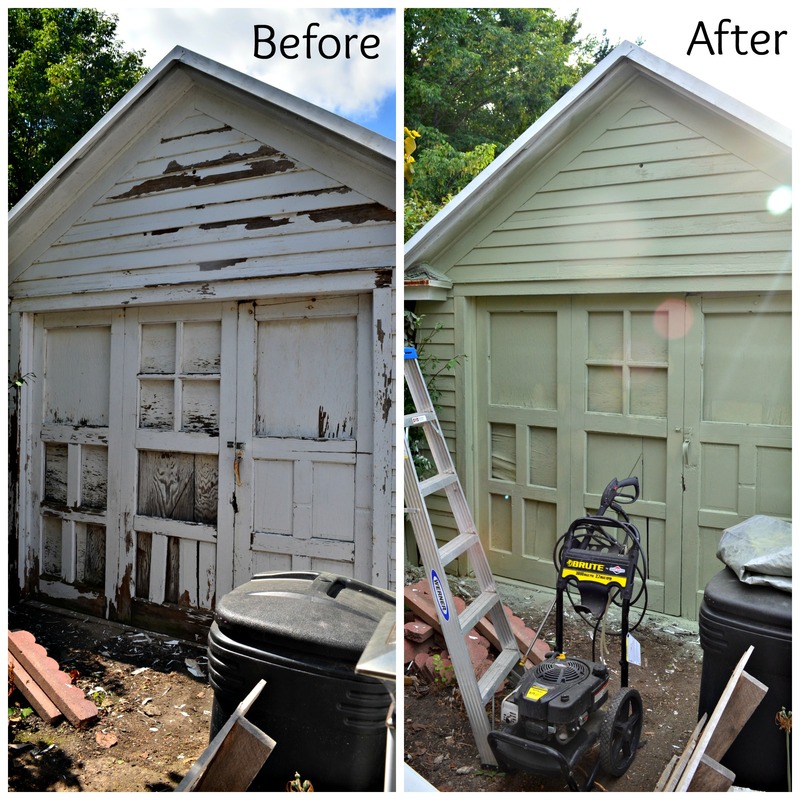 Categories: Outside, Paint, The Den | Tags: garage painted to match house, green garage, paint garage, painting wood siding, sage green garage, spray painter | Permalink. Thank you. Our garage was the one thing the guy who did our appraisal wouldn’t overlook. He gigged us on the fact it needed a new coat of paint. But he did overlook the half done ceiling in the bathroom. I guess he could see the vision on that! Are you planning to sell your current house soon? Not really. We had it appraised last year to get our house refinanced so we could afford to get the siding done. But we are not too emotionally attached to this house. 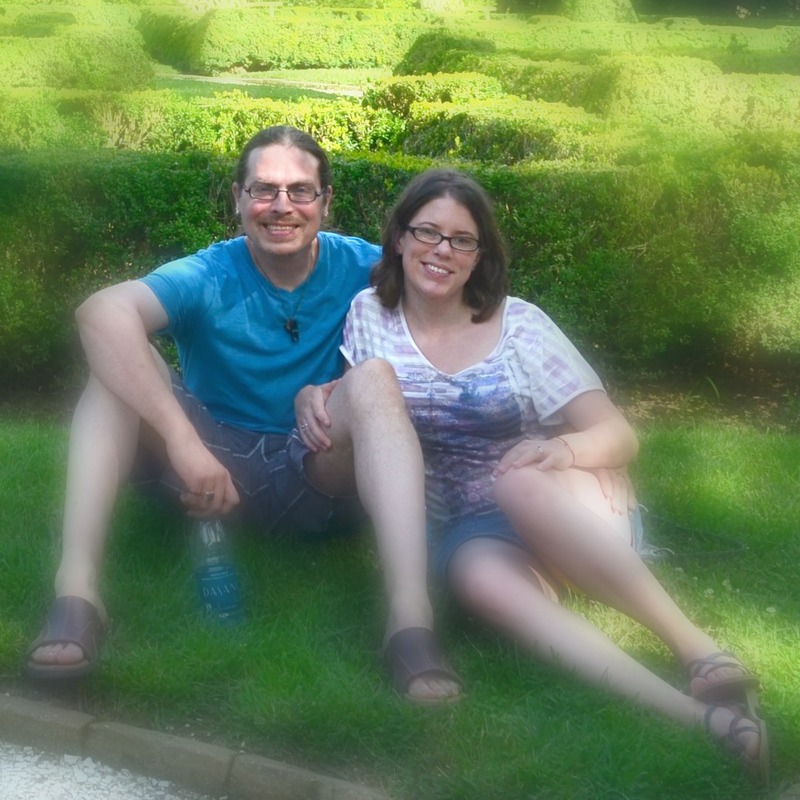 We would love a place with more land for our dogs (and for us, we are both country kids so city life isn’t what we really want) so we are keeping our eye out, you never know when THE perfect place will become available.